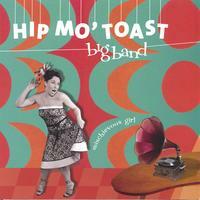 Titled Mischievous Girl after a rocking tune by the band's ivory-tinkler and Hammond-master Grant Windsor, this full-length studio album from the Hip Mo' Toast Big Band is a fun, party-time album for the more discerning swingers amongst you. Brand new compositions and arrangements are the standouts in this value-for-money jazz romp, with styles varying from the Perez Prado-inspired My Wee Bonita to the smoking Sealed Kiss. Making themselves right at home alongside kooky punter favourites such as Mambo Italiano and The Theme from the Blob are new songs by lead trumpeter Adrian Kelly, such as the slightly tipsy stride piano feature A Toast to You and the shadowy film noir Clean and Easy. Nestled amongst this new and impressive collection of original gems is an arrangement of Irving Berlin's Top Hat, White Tie and Tails written by the one and only Maestro Tommy Tycho especially for the Hip Mo' Toast Big Band - it's one for the jive bunnies! Also worthy of mention is Windsor's I'm Just Wandering Cowgirl which features another special guest, crooner James Flynn, who sings the part of wandering cowboy in perfect harmony with bandleader and vocalist Libby Hammer. The awesome 14-piece Hip Mo' Toast Big Band is well known to Western Australian audiences due to its record-breaking residencies in two prominent Perth nightclubs between 1999 and 2001, during which time they recorded an EP - Hip Mo' Toast Big Band Live - a raucous and unaffected celebration of how much fun jazz can be. The original incarnation of the band - a quintet - boasts two more recordings including the acclaimed Uptown Tight which was released in 2002. The Hip Mo' Toast Big Band are: Libby Hammer on vocals, Graeme Blevins, Ben Collins, Troy Roberts and Lee Buddle on saxophones, Adrian Kelly, Marty Pervan and Benn Hodgkin on trumpets, Michael Cartwright and Jeremy Greig on trombones, Grant Windsor on piano, Simon Jeans on guitar, Shane Pooley on double bass and Ric Eastman on drums. Brush off your tails because Libby and her thirteen noisy sidekicks always raise the roof and bring the house down! I had been looking forward to getting this CD for a long time. I saw them live and they were so good, I was afraid the CD would not be able to live up to my expectations. It did! I think I played it for three days straight. For anyone who likes big band swing, this is the album for you! The music is so good, I would bet people who dont think they like jazz would find some of these songs entertaining. Awesome CD, good work guys. I can\'t wait to see you guys again.